Is Christopher Nolan, the movie director behind the Batman series. a member of the Illuminati? Take a look at that thread on GodLikeProductions. In any case, the recent movie theater shooting is the second weird event related to the Batman series, after the bizarre death of Heath Ledger. When terrible events like the now infamous “Batman Shooting” occurs, I tend to not have a knee-jerk reaction of yelling “It’s a conspiracy” because, obviously, sometimes it is not. But in some cases, like this one, tidbits of information begin leaking out, weird synchronicities surface and, at a certain point, one can’t help but think “hmm”, “huh?” and “what?”. Pieces of the puzzle start coming together and, when one is aware of the symbolism and workings of the occult elite, the whole thing starts to look like a big, dark, disturbing ritual that was carried out by pre-programmed patsy. No, I won’t say that I cracked the case, but here are some facts that simply cannot be overlooked. As new information surfaces regarding James Holmes (who dubbed himself “The Joker”), many facts point toward a man who is prone to having alter-personas, delving into “inner-worlds” and generally exhibiting the behavior of either a schizophrenic or a programmed drone. Obviously in an altered state of mind and most probably embodying a completely different alter-persona, Holmes told police at the time of his arrest that he was “The Joker”. In this article that appeared in the Telegraph, Holmes was reportedly fixated on the concept of altered states of mind. “After the massacre Holmes calmly told detectives he had taken 100mg of the prescription painkiller Vicodin, and identified himself as “The Joker”. The same drug was found in the system of actor Heath Ledger when he died of an accidental overdose of prescription drugs in 2008. 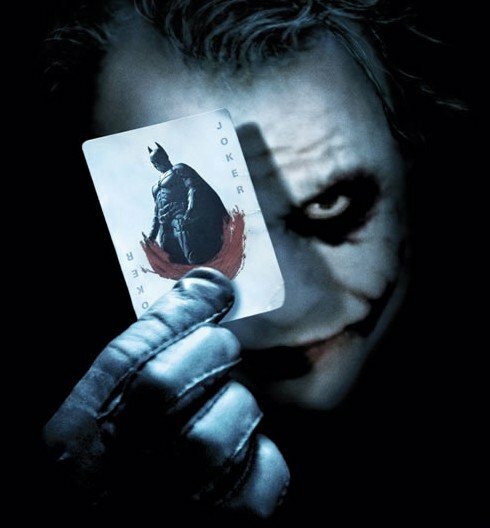 Ledger played The Joker in the previous Batman film The Dark Knight. Vicodin side-effects can include euphoria, paranoia and, in rare cases, hallucinations. The video footage of Holmes was taken at Miramar College in San Diego and showed him explaining that “temporal illusions” are “an illusion that allows you to change the past”. Holmes said he had been working on “subjective experience, which is what takes place inside the mind as oppose to the external world”. According to news sources, Holmes was pursuing a neuroscience doctoral program at the University of Colorado’s Anschutz Medical Campus. Could this prestigious academic location dedicated the study of human brain functioning and behavior also be Holmes’ mind-control programming site? The concepts stated above of “illusions that allow you to change the past” and “subjective experience” are very reminiscent to the programming of alter-personas in mind control, where illusions are indeed used to create a false pasts in MK alter-personas. After his arrest, Holmes appeared to be completely dissociated from reality, as if still in character. One-Eyed Heath Ledger as The Joker in this movie poster. There’s some Illuminati crap going on here. As stated above, Holmes dyed his hair orange and claimed he was “The Joker” – as played by Heath Ledger in the previous installment of the Batman series The Dark Knight. We’ve seen in previous articles (notably “The Imaginarium of Doctor Parnassus” and Heath Ledger’s Sacrifice), that there are many odd and ritualistic facts surrounding the death of Heath Ledger after he played the dark and disturbed character of the Joker, a role that apparently took a toll on the actor’s health. 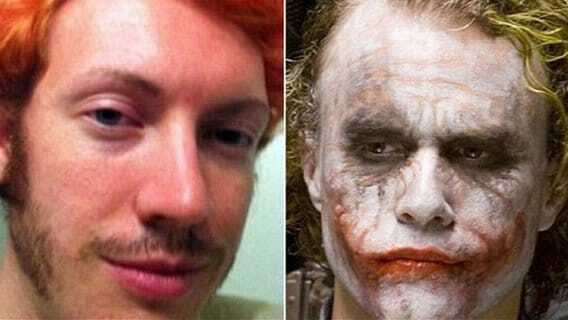 Shooter James Holmes even went as far as to take Vicodin, a drug found in Heath Ledger at the time of his death. Vicodin is a powerful pain-killer with morphine-like effects that is used in mind control to “dull out” victims. Is there some kind of ritualistic connection between The Dark Knight, the sacrificial death of Heath Ledger and this new installment of a Batman movie that was “launched” with a mass murder? Is there a reason why this mass-murder, which occurred during the midnight screening of a movie called Dark Knight RISING took place in a city called Aurora, the name Roman goddess of dawn (dawn being the time where the sun begins to rise)? Another interesting fact: Aurora is considered to be the mother of the morning star, also know as the Light Bringer, or Lucifer. Released only days before the shooting, Lil Wayne’s video “My Homies Still” features him and his boys sitting in a movie theater full of skeletons. Aside from this scarily prophetic scene, the video features many dismembered dummies, a symbol associated with Mind Control. Shown right before the fatal showing of Dark Knight Rises, this trailer of the movie Gangster Squad ends with a big shooting in a movie theater. In the trailer, gangsters walk through the movie screen and start shooting at the crowd. Strange that the people at the “Batman shooting” actually saw this right before it then happened to them. Fiction indeed turned into reality. 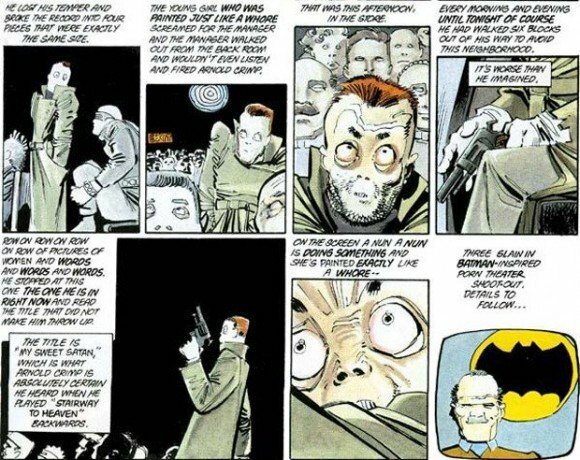 This page from the 1986 comic “Batman: The Dark Knight Returns” features a crazed man killing three people in a movie theater. In the comic, media then states that the shooting spree was inspired by Batman. Was the Batman shooting a mega-ritual carried out by the occult elite and its mass media appendage? It is not possible to say for certain, but a lot of the information that is surfacing leads Vigilant observers to realize: “Something’s weird about this”. As it is always the case in these types of events, the “investigation” will most likely begin and end with the proverbial “lone nut”, the single crazy psychopath toward which all fingers will be pointed. Were there people pulling his strings? Maybe, but the media always show the puppets, never the puppet masters. Some might ask: “Why would ‘they’ even want to carry out these kinds of rituals?” It is indeed quite difficult to compute these events without taking into account “their” mindset, which is all about magick, symbolism, numerology and the power of rituals. Blood sacrifices are the most potent forms of ritual and the more people who witness and emotionally participate in that ritual, the more potency it gains. Right now, the whole world has its eyes turned towards the town of Aurora. And while outraged citizens across America demand a culprit to pay for this horrendous act, the REAL masterminds behind it will just sit back and enjoy the show. In any case, as Lightworkers, let us respond with love and with Light to the Illuminati. Let us neutralize the dark cabal in a positive manner.